Key equity indices gained over two per cent to close above 34,700-mark on Friday, rebounding from the losses made after widespread global sell-off which had dragged the domestic markets down by almost same percentage on Thursday. Except for IT and TECK (technology, media and entertainment), all sectors were in the green, led by finance, banking and auto counters. The auto sector gained over four per cent in the day's trade. The domestic currency traded below the 74/dollar-mark. At 4.00 p.m, the rupee stood at around 73.65. It closed at Rs 74.12 to a USD on Thursday. The NSE Nifty50 provisionally closed at 10,472.50, up 237.85 points or 2.32 per cent. 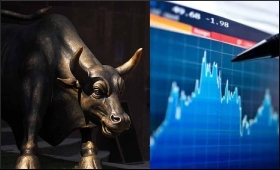 The top gainers at Sensex were Maruti Suzuki, up 5.89 per cent at Rs 7,283.05; Mahindra and Mahindra up 5.29 per cent at Rs 768.80; and Kotak Mahindra Bank, up 4.87 per cent at Rs 1,169.40 from their previous close.